Quantum Physics, Spirituality, your thoughts, emotions, and success or lack of success in life are ALL closely intertwined or interconnected. What is the source of the universe? This is a question that has haunted us since the beginning. Quantum Physics is a detailed study of how EVERYTHING in the cosmos has come to exist beginning at the atomic and sub-atomic levels. More simply put, it is an in-depth study of the building blocks of the ENTIRE Universe, the SEEN and the UNSEEN. Basically, the Quantum Physics tries to analyze the things that are experienced in life in various forms and tracing them back to where they originated and were derived from which as you will soon discover consists of pure energy or 'light'. The purest form of energy according to the really 'intellectually intelligent' scientists who study Quantum Physics is what they refer to as wave forms of probability that exist within an infinite field of probabilities. Quantum Physics reveals the Universe to be a single gigantic field of energy in which matter is just a 'slowed down' form of energy. Further, it says, matter/energy does not exist with any certainty in definite places, but rather shows 'tendencies' to exist (i.e. the 'Uncertainty Principle'). Even more intriguing is the notion that the existence of an observer is fundamental to the existence of the Universe - a concept known as 'The Observer Effect' - implying that the Universe is a product of consciousness. (i.e. the Mind of God) 1 E=MC2 and Cosmos --> Universe --> Galaxy --> Earth --> Individuals --> Organ Systems --> Cells --> Molecules --> Atoms --> Subatomic Particles = Energy (light). EVERY probability whether past, present or future exists as a wave form. They're still trying to figure out where these "wave forms" come from and what enables them to exist at all. "Quantum Study of light on atomic level led to finding that light was not waves but ended in lumps of light, not continuous, at the atomic level. God particle is light, and matter comes from it. 1. Acts of consciousness and mind, create matter the universe. 2. There is a field, mind of God, that bubbles these acts of consciousness into the universe and into our mind. 3. Stuff of the universe is light, field or mind of God, Higgs field, if it wasn't there everything would be whipping around at the speed of light, without matter. Matter comes into existence when particle light interacting with the mind of God, creating mass, inertia comes into existence. Higgs came into being later, first there was only light. God said let there be light, there was light. There are 2 kinds of light, spin-one-half, becomes material world interacting with this field, spin-one light, doesn't interact with mind of God, but messengers between spin-one-half particles. Higgs field brings universe into existence. To physically move takes effort, it's actually relationship of light of your body with Higgs field. If field is weak then you will become a Light Being. Mind of God is keeping everything, matter, to become light. Bridging spiritual and scientific. Quantum field theory research lead to this book [Time Loops and Space Twists]. You learn more by teaching. Explaining to lay audience proves you really know it, to make it simple. Quantum - Study of light on atomic level lead to finding that light was not waves but ended in lumps of light, not continuous, at the atomic level. The material should not be the primary and only things we think about. Thinking about the ideal, like Plato, not manifest, beyond the material senses. 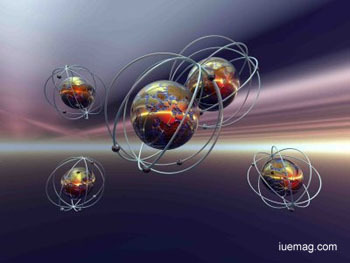 Time & Space: Fundamental units of matter grouped into "fermions" and other is "boson". Fermions are particles with property of half spin (spin one half). Boson property made of one spin. These particles are not matter, light particles, move at the speed of light, fermion light and boson light. Fermions light not normal light like Boson light [eg. sunlight], it is zigzagging in space and time, creating space and time. When [Fermions] zigzagging in space maybe interact with something to turn and zigzag, a field, a Higg's field, slows down and makes matter, quarks and leptons. What's special about light particles? Einstein proved about light always moves at the same speed, whether going towards it or away from it - not relative speed, space and time must change to accommodate light speed so it be the same. It was an astounding discovery. So space and time are not the arena or primary, a construction from light. Light is the big guy that makes space and time. When moving at speed of light, there is no space, no time. For light, time and space is one, not separate, nothing is moving, not increasing or decreasing. For light the whole universe is a dot, everything is one. We are on the slower than light side of the wall and therefore move and think within time and space, we can measure time and space. For light space and time don't exist, they come into existence fromlight. "You are a body of light interacting with the mind of God". How does time and space disappear or come into being. In the beginning there was no space time or matter. Because the beginning was light, Higg's field. Fermions zigzag in time, they are a mirror of zigzag and they become faster than light. Quantum physics says observation of an event takes place, before the observation cognition, mental activity, objects are not in an objectified physical form, they are in a field of probability which is called, quantum wave function QWIF, when observation occurs, there is an instantaneous collapse of possibilities into actuality and the perceived event, cognition, physicality pop into existence faster than the speed of light. If 2 things have at one point interacted and then separated from each other they can be light years away, these 2 particles affect each other, if we do something to a particle here, the particle on the other end of the universe will reflect the same change instantly. So a mind like activity must take place faster than light. Zigzagging in time, they are the mental activity, that's mind. The universe is a mind, our mind is taking part. Electrons in the brain, gate molecules, etc.